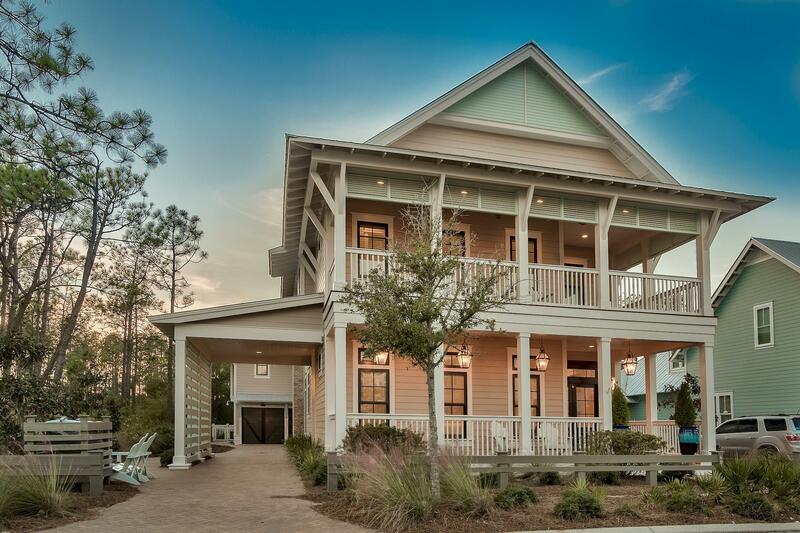 This custom-built WaterColor home offers 4,082 square foot of coastal living with 6 bedrooms and 6.5 bathrooms. *Check out the virtual tour of this amazing property in the Photos section. * The main house features 4 bedrooms and a drive through porte-cochere leads to the carriage house that features 2 bedrooms. The oversized porch features beautiful Cumaru wood decking, tongue and groove wood ceilings, copper light fixtures and magnificent double mahogany doors. Stunning custom interior details include wide plank Ash wood floors, shiplap walls, custom molding and cabinetry throughout. The first floor offers a free-flowing layout with a combination of transom-topped windows and French doors that bathe the living and dining area with an abundance of natural light.